It is generally much easier to be long-term bullish on gold than holding a firm opinion on its short term prospects. Clearly, the post QE economic landscape is an accident waiting to happen in view of the massive debt build-up and the capital malinvestment induced by interest rate suppression and money printing. The timing is what remains open to question, but the warning shots are becoming more frequent. We have not mentioned money supply growth yet, which remains quite weak. This is superficially bearish for gold, but since a dearth of excess liquidity is mainly dangerous for “risk assets” and economic activity, gold market participants may actually consider this to represent a bullish datum at present. There is a lively debate underway between gold aficionados with respect to the outlook for gold in coming months, and many well-informed observers are skeptical in view of the recent mixed bag of fundamentals. However, there are actually a few signs pointing to the possibility that gold could rally in advance of the fundamental backdrop turning unequivocally bullish. Readers may recall that we have mentioned this possibility on previous occasions. A number of recent developments are lending additional support to this idea. For one thing, as Keith Weiner regularly points out, in recent months his fundamental gold price indicator (which is inter alia derived from the spread between gold futures and spot prices) shows that there is persistent buying of physical gold in the market. We suspect that reservation demand is quite strong as well – after all, why would holders of bullion sell? The need for having some insurance against potential economic and financial turmoil seems crystal clear. The same goes for the need to defend one’s wealth against increasingly rapacious and intrusive governments. JSE Gold Index: we have circled the breakout we discussed in October in red. It was followed by a textbook retest, and then it was off to the races for good. Apart from signals we get from market indicators one would also do well to ponder a number of recent events and their likely impact on gold prices down the road. 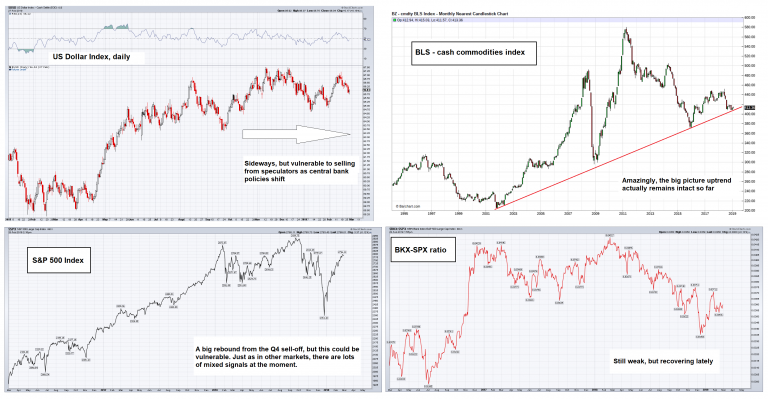 In this context one also needs to keep in mind that gold prices will probably lead future fundamental developments. For one thing, the Federal Reserve’s sudden about-face regarding its policy bias may well end up damaging its much-vaunted “credibility”, despite the fact that it was greeted with great enthusiasm by market participants. It certainly feels as if Fed members are slowly realizing that the central bank is boxed in. It seems “QE” is akin to the Hotel California: you can check in, but you can never leave. Western central bankers should have known- all they had to do was look at Japan. After all, Japan isn’t on another planet. In Japan they now have QE and ZIRP forever and ever, a scary and inexorably rising pile of public debt, while economic growth is increasingly disappearing into the realm of myth and legend and vast swathes of the population seem to be suffering from depression. Why this didn’t set alarm bells ringing is a complete mystery to us. Our guess is that it was a case of extremely misguided central planner hubris. Gold is traditionally a major beneficiary of crumbling faith in the monetary authority and we don’t think that has changed. 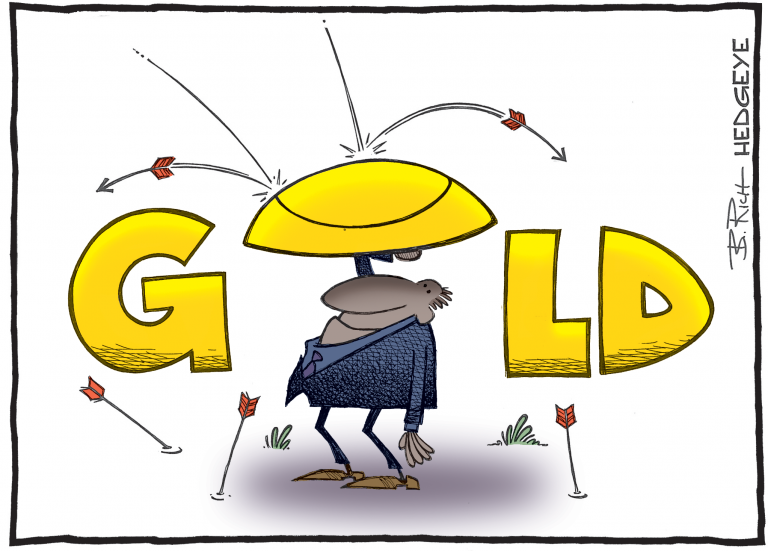 The Fed’s credibility should therefore definitely be of concern to anyone interested in the gold market. Hedgeye cartoonist B. Rich quickly responded: Jerome Powell as Peter Pan, chained to the S&P 500 and lastly in his new role as the Dovefather. 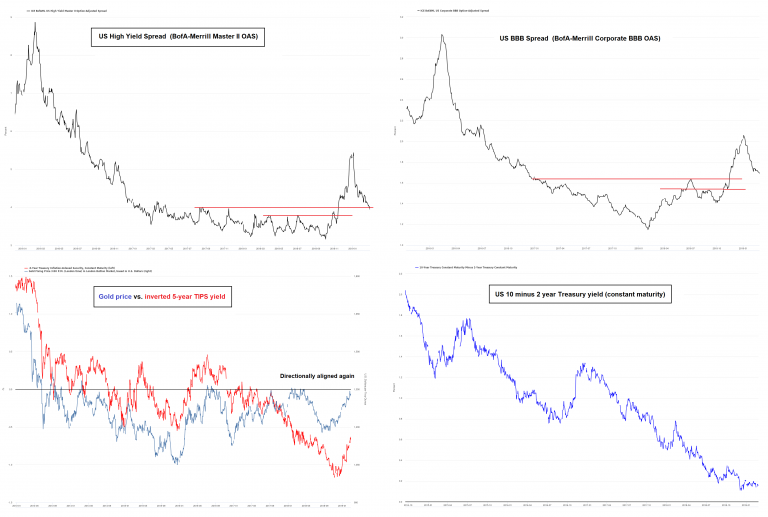 This brings us a few other recent events that are giving us pause (interestingly, we have so far not seen them discussed elsewhere in the context of gold). As Mish reported, a study by the US Department of Commerce has come to the bizarre conclusion that European car imports do indeed pose a “threat to US national security”. Not only that, but his attempts to put pressure on the EU with respect to the Iran deal were less than successful (as an aside to this, we are generally on board with most of Donald Trump’s foreign policy efforts and are often disappointed when they are thwarted, but we think ditching the nuclear treaty with Iran was a mistake). Along similar lines, his attempt to persuade Germany to abandon Nord Stream 2 – after which the US is presumably going to sell LNG to the Germans at roughly twice the price Russia is charging – were not exactly welcome either (see once again Mish for additional color). That there is a rift between the Trump administration and the EU has been obvious for quite some time, but lately it seems to be growing. Clearly the rhetoric is becoming more adversarial, as inter alia evidenced by Ms. Merkel’s speech at the conference. Since the political establishment of the EU is increasingly under threat from its own unhappy voters, we would not expect it to back down when it is confronted with outside pressure. 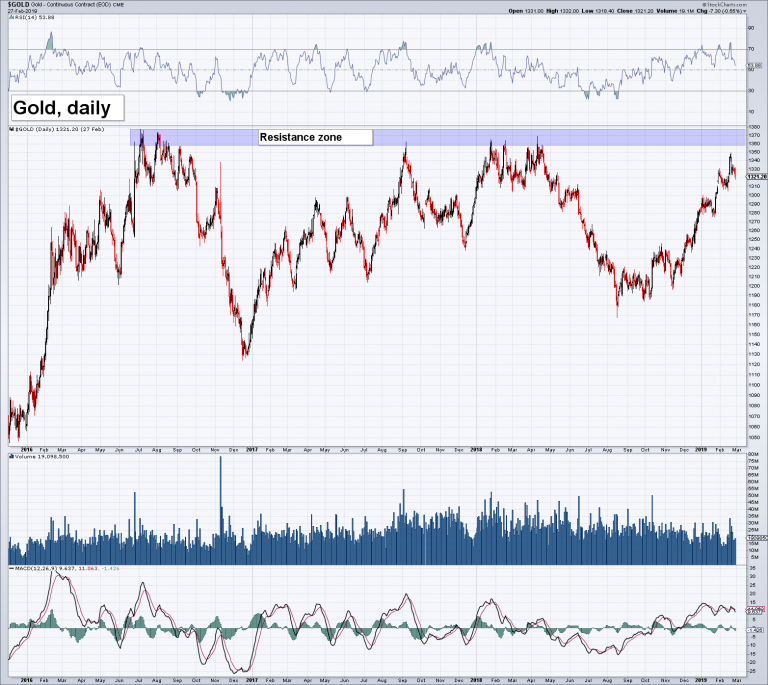 Normally we ignore geopolitical developments in the context of gold analysis. Empirical evidence suggests that gold price spikes triggered by geopolitical events are invariably given back, i.e., they usually represent short term selling opportunities. However, if it seems possible that monetary and economic policy could be affected, one should pay attention. The report by the US Commerce Department on European car imports indicates that the recent US-EU spats could indeed affect economic policy. Transatlantic dissension in particular tends to create a bullish backdrop for gold. This was e.g. the case in the late 1960s and early 1970s when the Bretton-Woods agreement fell apart. It was once again a factor in driving gold prices higher in 1987, when the US administration clashed with Germany over the Bundesbank’s tight monetary policy. With the EU increasingly coming under strain – it is losing its third biggest net payer now that the UK is exiting – the fact that it is a major beneficiary of what is referred to as the Pax Americana is coming into stark relief as well. European citizens with assets to protect are undoubtedly eyeing a potentially weakening security umbrella with concern. While the allies are likely to resolve their disagreements eventually, things could easily get worse before they get better. Gold investors should keep a close eye on these developments, especially if they end up affecting cooperation between central banks. We say this because Mr. Trump’s trade policies cannot be divorced from currency policy. A weakening US dollar became a major bone of contention in both the 1970s and 1980s and this could eventually happen again. The HUI-gold ratio is slowly trending up in “two steps forward, one step back” fashion since establishing a low in early September 2018. We mentioned above that some short term excitement was stirred up when gold approached lateral resistance at $1360. However, it is difficult to argue that sentiment ever came close to anything akin to foaming-at-the-mouth bullishness at any time during the advance. On the contrary, prior to the move from around $1300 to $1350, it felt to us as though the gold rally was widely dismissed as an unsustainable counter-trend move. The halting advance in gold stocks struck us as a symptom of this widespread skepticism (which the recent pullback has probably revived). A friend recently described the sector as “boring” to us – which actually describes it well. Obviously there are exceptions, such as the stocks driving the rally on the JSE and certain individual stocks like Kirkland Lake, but overall the sector is not really doing much considering its traditionally high beta. Well, you know what they say about dull markets. An investor who purchased his portfolio hedge in good time.